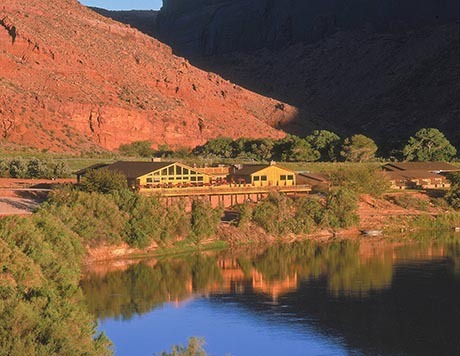 Check into Red Cliffs Lodge on the banks of the Colorado River, a secluded location 14 miles outside of downtown Moab. Take the evening to unwind at the pool, read a book on your private patio or explore famous Castle Valley. 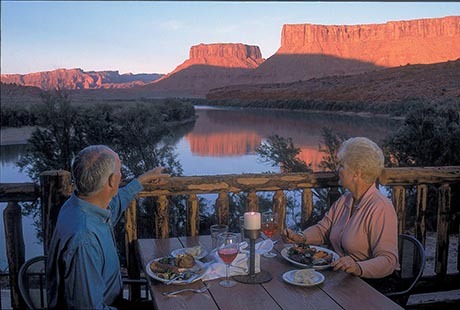 Savor a spectacular sunset dinner on the Red Cliffs Lodge deck overlooking the Colorado River. (Prices are based on double occupancy. Please select "single supplement" if anyone in your party will be staying alone in a room). 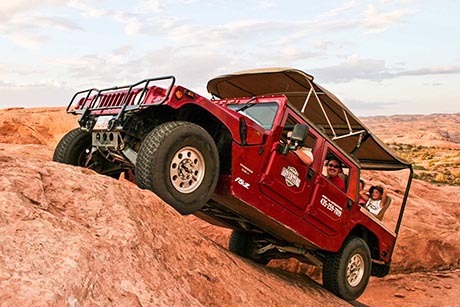 After breakfast at Red Cliffs, meet at the Moab Adventure Center at 9:45 AM for an exhilarating off-road Hummer Safari. You’ll access Moab’s spectacular back country in style and comfort aboard the world’s most serious 4x4. 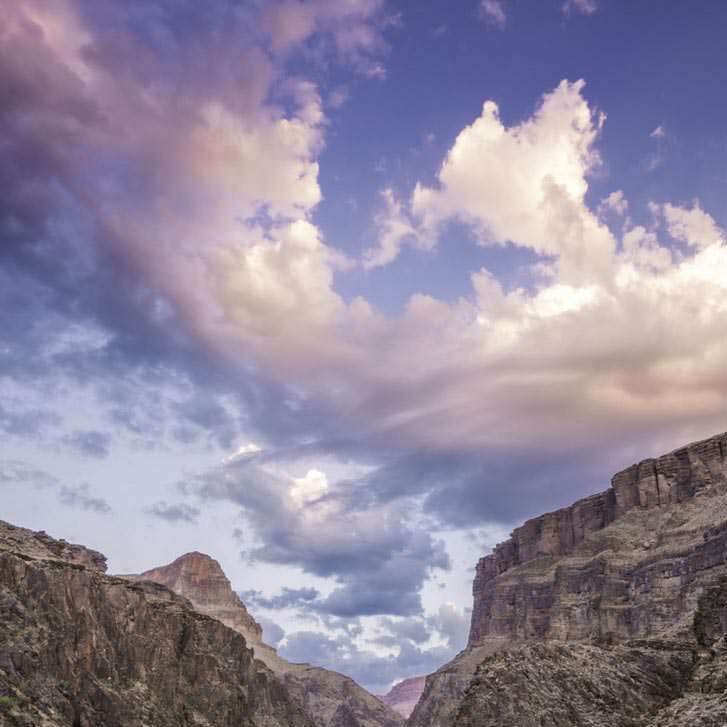 Climb to the top of seldom-seen, awe-inspiring overlooks and return with a new feeling of freedom and unforgettable memories. Take the afternoon to explore the National Parks or go horseback riding (rides are offered at Red Cliffs Lodge - advance booking recommended). After an early morning breakfast buffet, a shuttle will arrive at Red Cliffs (approx 8:10 AM) to take you to Westwater Canyon. 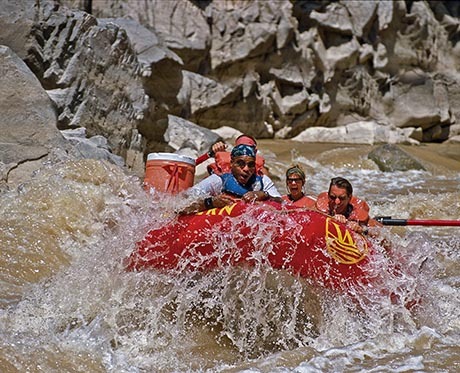 Labeled “The West’s Best Short Whitewater Trip” by National Geographic, this one-day Utah rafting adventure gives you everything from relaxation on calm waters winding through amazing geologic formations to the excitement of Colorado River whitewater. After your return to Red Cliffs Lodge around 6:00 PM, you’ll have time to enjoy a dinner in town on your own or spend another evening dining at Red Cliffs. Enjoy a delicious breakfast buffet and relish one final morning at Red Cliffs Lodge before checking out by 11:00 AM. Head home with endless stories of the perfect adventure in Moab, Utah. Note: Upon check-in, you’ll receive a voucher for one dinner at the Red Cliffs that can be used on day one, two or three. Check into Red Cliffs Lodge any time after 3:00 PM. 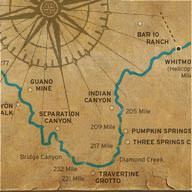 The ranch is located about 25 minutes outside of downtown Moab on Highway 128 at Mile 14. Centered around the quaint town of Moab, Utah this trip offers plenty of opportunity for additional adventure, shopping, dining and relaxing. At any time before departure, Western can add to your itinerary additional activities, lodging, airport shuttle, and jeep rental. Simply give us a call and we'll arrange everything for you. Check into Red Cliffs any time after 3:00 PM. 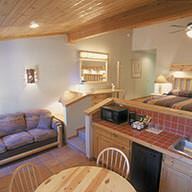 Red Cliffs Lodge is located about 20 minutes outside of downtown Moab on Highway 128 at Mile 14. Check out time is 11:00 AM on your final day. 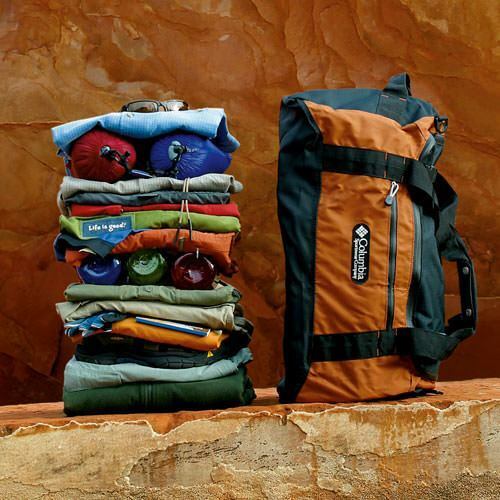 For optional 2-hour to full-day excursions in Moab, Utah before or after your trip plus helpful Moab area information, visit www.moabadventurecenter.com.